For New Year’s eve every year, a group of us have been regularly finding a dinner and drink deal where we can celebrate with some good food but without the hassle and craziness that goes along with this annual night. 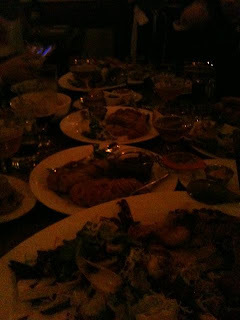 One year it was a great meal at Sala One Nine where the food and drink for 3 hours was plentiful. One year we went to Angelo & Maxie’s where the food and drink deal was also great, but the crowd got a little out of hand for us. This year we were throwing around ideas of what to do when we got an email from Resto about their New Year’s eve event. The Pig & Poularde in Half Mourning Large Format Feast. For $150 it promised some amazing dishes made from two animals from local farms. A bunch of tasty desserts and all the Belgian beer, wine and spirits you could handle. Hmm…tons of meat, all the Belgian beer I can handle….Maybe one of the easiest decisions I’ve ever made! We got there right at the start of the event at 9:30 and they were still setting up so we had some drinks at the bar. Now when they said everything was included, they meant absolutely everything! So I started out with one of their special winter cocktails the colonel Kilgore. Whoa this was certainly a winter cocktail. The bartender mixed together aviation gin, chartreuse, maraschino liquor and lemon, shook it up then lit a piece of rosemary on fire and threw it all together in a glass. It was excellent. The toasted rosemary gave it such holiday taste- like I was sitting under a fir tree or something. Weird I know but whatever. After that cocktail it was down to business with a plethora of Belgian beers and way too much food for any person to possibly eat in one sitting. Here’s a layout of our first course. I’m just going to list out the amazing huge dishes that made up this “first course”. OMG there was so much good food going on in this first course. Almost everyone agreed that the highlight of this meal was the Confit Poularde Thigh and the Crispy Pork leg salad. Pork is fatty and wonderful on its own but when you toss it with some breadcrumbs and throw it in a deep fryer- watch out. Dip it in the rillet and basically you have a heart attack on a platter. So unbelievably bad for you but so insanely good. The portions were enormous and even after just tasting a little bit of everything I was stuffed. Three different kinds of sausages, huge platters of chicken and pork, rich Belgian beers. I was done before I even began I think. All of us were stuffed with food leftover when the second course of our meal arrived. The poularde in half mourning was the highlight of this course for me. It came with a little bit of truffle oil that went perfectly with the onion and bacon. I was silently thanking God for wearing a dress that evening so my waistline could expand without fear as I went for a second heaping of this dish. The cream spinach was amazing tasty as well. More spinach than cream this was actually quite a light component to the second course of the meal. The only dish that really missed the mark for me was the salt and pepper ribs. The ribs had actually been cooked confit- so immersed in their own fat basically. Now I love ribs but this style of cooking them was just to much. The whole slab just had the taste and texture of pure fat. It was completely unappetizing to say the least. By this point I was almost ready to be sick and we had enough food left over for an army. They broke out the prosecco as we toasted midnight and then turned on the music for an all out dance party as they served the final course of waffles and cookies. Resto was certainly a good deal. The service was the best I’ve ever had before. There was one waiter per table and ours was absolutely great. He was very knowledgeable about the beers and menu and was constantly there filling up water glasses and clearing out our plates. I got to try about 10 different Belgian beers and I did enjoy the food. The only thing that bothered me a little was the amount of food. 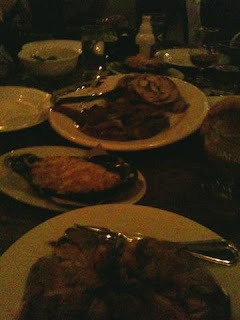 We easily could have stopped eating after the first course and the second course was even bigger than the first. I felt bad leaving all of that food behind and I couldn’t even drink much beer afterwards because I was so full from all of the meat. Overall I enjoyed my Resto meal and would consider returning again if they scaled it down a notch food wise. Maybe only one animal next year rather than two. I got to try a lot of excellent beer from a St. Barnadus Whitte to the amzingly smooth Scotch Silly. I’ve always been a little conflicted about this place but they put on quite the great party I have to say. Sounds awesome. You should really go back to Resto for their brunch "Hangover Pasta" - OMG. Best thing ever.